(Nanowerk News) An array of hollow piezoelectric polymer nanotubes grown by A*STAR researchers could be used as an extremely sensitive acoustic sensor. The tubes are made of a piezoelectric polymer called poly(vinylidene fluoride-co-trifluoroethylene), or P(VDF-TrFE) — to which applying a voltage causes a change of shape; conversely, the polymer generates a voltage when it is pressed or twisted. Piezoelectric polymers are considerably more flexible than other piezoelectric materials, and are highly responsive to pressure. Forming piezoelectric materials into nanotubes can enhance their properties, but flexible polymer nanotubes tend to aggregate into bundles. The tips of vertically aligned hollow polymer nanotubes poke out of a porous alumina template. Kui Yao and colleagues at the A*STAR Institute of Materials Research and Engineering, and the National University of Singapore, have now developed a method to create vertical arrays of hollow P(VDF-TrFE) nanotubes, significantly increasing their piezoelectric capabilities ("Nanoconfinement induced crystal orientation and large piezoelectric coefficient in vertically aligned P(VDF-TrFE) nanotube array"). “For the first time, we have demonstrated enhanced piezoelectric performance in a high quality P(VDF-TrFE) nanotube array,” says Yao. The team first made a template — a thin sheet of anodized alumina with vertical pores up to 4 micrometers deep and 350 nanometers wide — and added a coating of P(VDF-TrFE). Heating to 250 degrees Celsius melted the polymer into the pores, coating its walls. They repeated the cycle 15 times to create a polymer coating 60 nanometers thick. They covered the polymer-loaded template with a thin gold electrode, then flipped the structure over and mounted it on a glass substrate. 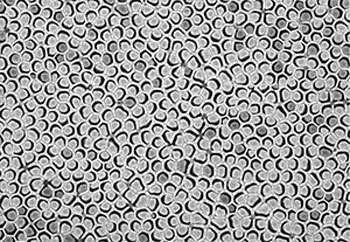 They used an acid to etch away part of the alumina, exposing the tips of the hollow polymer nanotubes inside (see image), and capped them with another gold electrode. X-ray diffraction and infrared spectrometry revealed that the electrical polarization of the polymer was aligned with the nanotube’s axis, which increased the overall polarization in that direction by 1.5 times. “The dominant mechanism for enhanced piezoelectric performance is based on this unique molecular orientation and the nanotube’s structure,” says Yao.